User: The Southern Electric Authority of Qld. Revenue usage: Numeral 1936 issue 1d, 2d, 3d, 6d, 1/-. 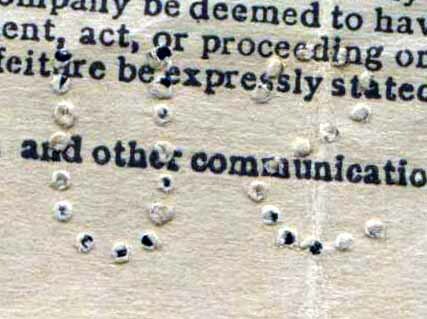 1956 Security underprint 2d. 1966 issue 2c. Rarity Scale: Numeral 1936 issue 1d R4, 2d R1, 3d R2, 6d R4, 1/- R3. 2d underprint R4. 1966 issue 2c R2. 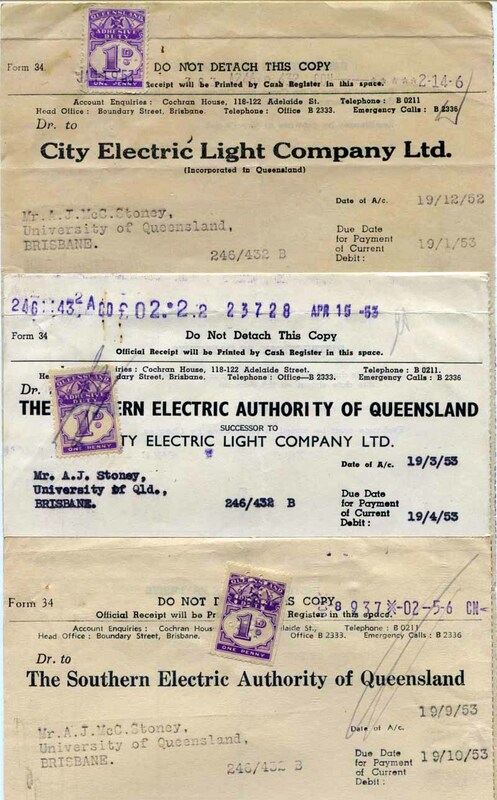 Background: In 1939 the State Electric Company was formed to manage the transfer of the responsibility for the provision and distribution of electricity in Queensland from the public company, City Electric Light Company (see CEL), to a Government body. This process was somewhat delayed by World War 2 but in 1952 the Southern Electric Authority (SEA) of Queensland Act was passed which saw the shareholders of the City Electric Company bought out by public funds. The management and existing board stayed in place but with the addition of the State Electricity Commissioner and the undersecretary to Treasury. The SEA was officially launched on 1 February 1953 as a public authority which was intended to run until June 1968 when the authority would be absorbed into the Queensland Government without further payment. 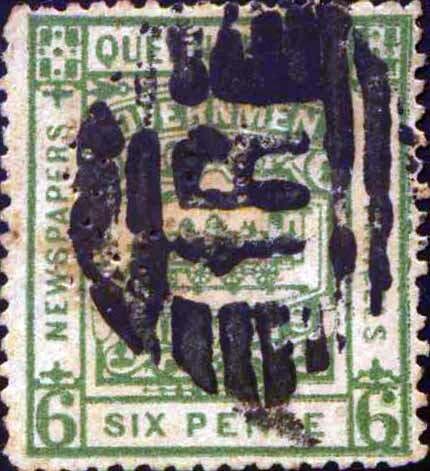 Device: The SEA device was most likely a single head device and due to the narrow nature of the revenue stamps of the period it is generally struck to read vertically up the stamp (position 2) and occasionally reversed (position 6). 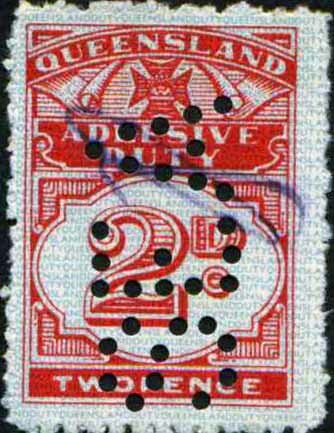 The pattern is only found on revenue stamps of Queensland from 1953 until 1967. Note: SEA finally chose to precancel their revenues with an SEA overprint. See Other Tab. QV (1892) 6d, 1/-. (widow weeds) 1d. KGV 1920 issue 1d, 2d. 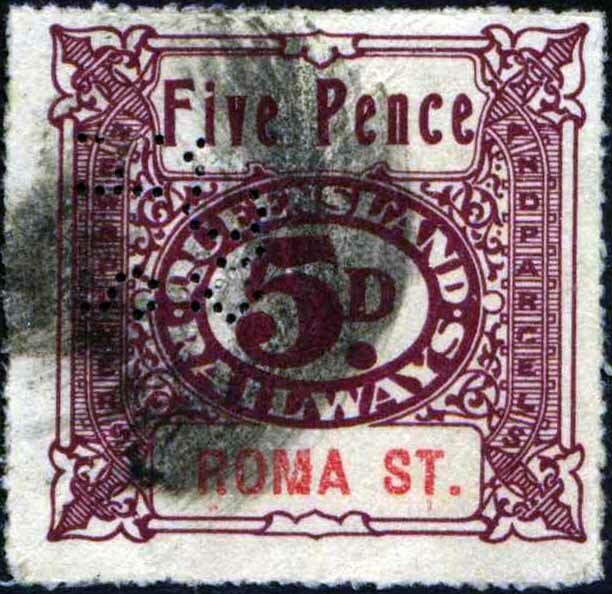 QV (1892) 6d R4, 1/- R4. KEDVII 1901 issue 1d R1, 2d R1, 3d R1, 3d (double) R4, 6d R4, 1/- (6mm Q wmk) R4, 1/-, (8mm Q wmk) R2. KGV 1920 issue 1d R4, 2d R4. 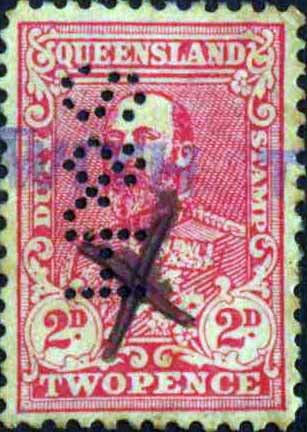 1902 issue 3d R3, 6d R3. Background: Alexander Stewart and William Hemmant started Stewart and Hemmant as a partnership in Brisbane in around 1863. Initially as a Drapery on the corner of Queen and Albert Streets but after a fire which engulfed an entire city block, including their premises, they relocated to the corner of Queen and Adelaide Streets where they expanded into retail clothing. The partnership was dissolved in 1871 when Hemmant entered Parliament. However Hemmant remained with the firm in Brisbane and later in the London office in diminishing roles until his death in 1916. The company grew through the 1880’s and started to manufacture clothing in work rooms in Adelaide Street to supplement the range of imported clothing that they sourced. Later in 1898 they took the bold step of establishing a purpose built manufacturing plant in Fortitude Valley. This was a large premise and on commencement they employed over 275 machine operators. They later built another manufacturing plant at Ipswich. In 1903 the Company was restructured as Alexander Stewart and Sons and all shares were allocated to the family. Despite the name change the company continued to use the S&H device. In 1921 preference shares were made available to the general public. In September 1926 the company went into voluntary liquidation. Device: The device is a single head device and it was most likely located in the Queen Street premises as there is no postmark or cachet evidence of Fortitude Valley of Ipswich use. There are subtle changes to the pattern over time. In around 1906 the shape of the H alters slightly and the left hand upright develops a slight bend the right near the top. Later around 1915 the right hand upright of the H shows a distinct wobble above the cross bar of the H. Both of these changes are most likely the results of repairs to the device. These repairs may have ceased after 1915 as towards the end of the devices life it is characterised by missing pins in the S and the top of the H and the strikes tend to have many incomplete holes. 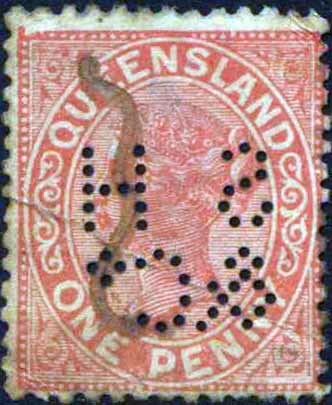 The pattern is found on postage stamps of Queensland and the early Commonwealth period as well as Queensland revenues and railways. Usage is from 1899 until about 1920. User: S.(Sigmund) Hoffnung & Co Ltd.
QV (1882 state issue) 1d. 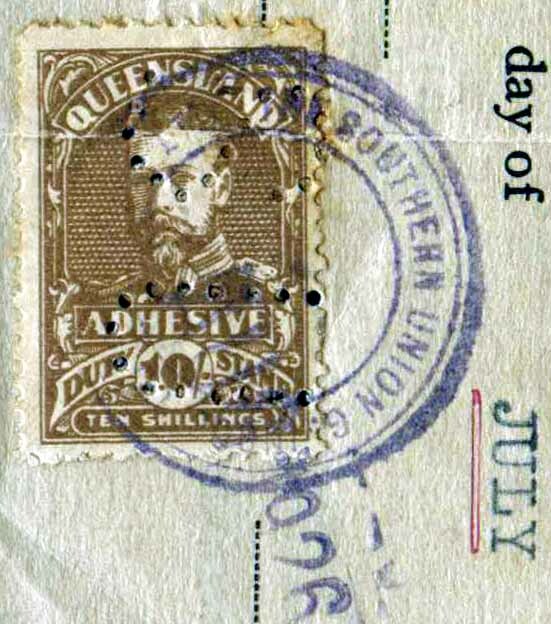 QV (1895 state issue) 1d. QV (widow weeds) 1d. KEDVII 1d, 2d, 3d, 3d (double), 6d, 1/-. KGV 1920 issue 1d, 2d, 3d, 1/-. 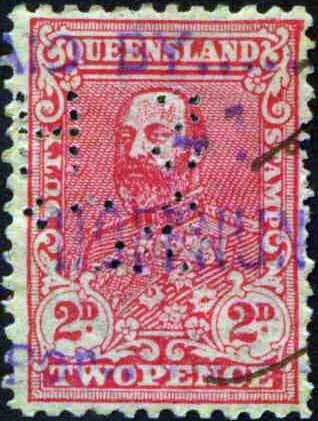 QV (1882 state issue) 1d R3. QV (widow weeds) 1d. 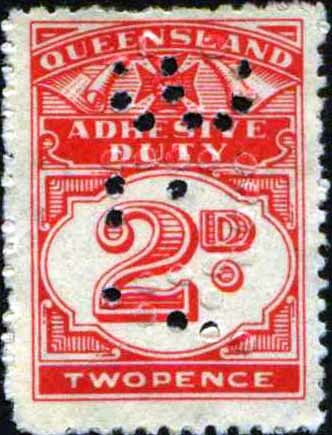 QV (1895 state issue) 1d R2. KEDVII 1d R4, 2d R3, 3d R4, 3d (double) R4, 6d R4, 1/- R4. KGV 1920 issue 1d R3, 2d R2, 3d R4, 1/- R4. Numeral 2d R4, 3d R4. 1902 issue 1d, 3d, 6d, 1/-. 1927 numeral issue 5d, 1/-. 1902 issue 1d R3, 3d R3, 6d R3, 1/- R4. 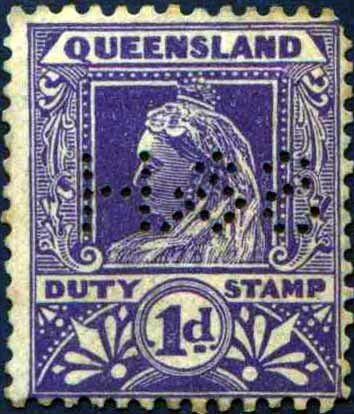 1915 issue 3d R4, 2/6d R4. 1921 rouletted issue 3d R4. 1927 numeral issue 5d R3, 1/- R3. Background: Sigmond Hoffnung was born in Poland in 1830, the son of a Jewish Rabbi, but his family migrated to England in 1936. He was educated in Liverpool but due to lack of money he took a job as a junior salesman with a West Country firm. This proved beneficial as he became friendly with a customer, Henry Nathan, who lent him £500 to buy assorted goods and take them to Sydney for resale. Hoffnung arrived in Sydney early in 1852 and opened a wholesale business in Wynyard Square. Sales went well and he was able to repay his loan and subsequently secured more stock from England with Nathan acting as his buyer. This arrangement proved successful and in 1855 Hoffnung moved to larger premises in George Street. He returned to England briefly in 1857 to formalise his partnership with Nathan and to make purchases of more stock. In 1870 S. Hoffnung & Co. moved into new premises in Pitt Street and in 1871 they opened a Brisbane branch. The company also established other branches in Australia, New Zealand and Fiji and had its head office in London. They also had a large factory in Sydney making saddlery and harnesses. Their range of wholesale goods included American canned fruits and jams, watches, glass and china, ironmongery, rocking-horses, firearms, iron safes and patent medicines. Hoffnung set up the first opal-cutting business in Australia and exported uncut diamonds and sapphires for industrial use. In 1875 he was on the committee of the Trade Protection Society of New South Wales. In 1877 Hoffnung returned to England and took charge of the London office. His brother Abraham, who had been a successful merchant in America, Canada and England, joined S. Hoffnung & Co. in 1886. Abraham spent some years in both Australia and in London. In 1889 Sigmund retired from the company and it was restructured as a public company in 1902. Later the company moved its headquarters to 153 Clarence Street, Sydney. Hoffnung died on 27 August 1904 aged 74. He was survived by his wife and their only child Sidney. Sidney worked in the company and after marrying Violet Goldsmid, he took the name Hoffnung-Goldsmid. He served as a director of the company and died in 1930. Device: S Hoffnung and Co used a range of devices in their offices in Sydney including various formats of SH and SH/&/COLTD but in the main they used SH/&CO. This Brisbane SH/&CO is the only pattern found used in Queensland. 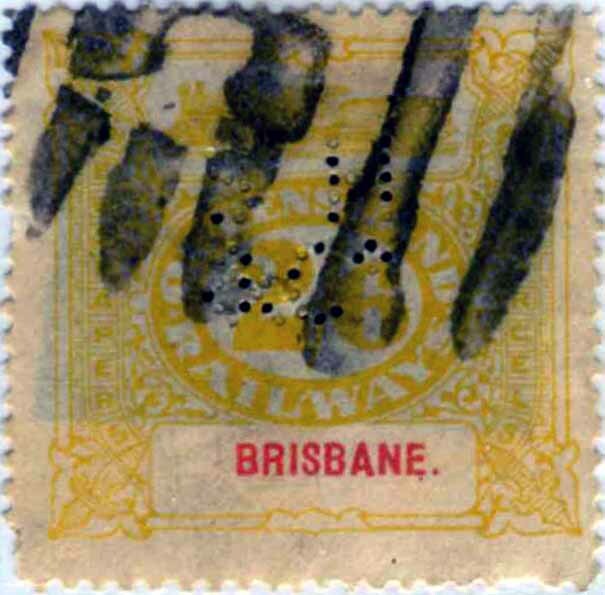 S Hoffnung and Co first applied to the NSW postal authorities in 1887 for approval to use perfins but no record has been found of the application for this Brisbane device with the Queensland Post Office. The Brisbane SH/&CO device was a long serving one being used from c1891 to as recently as 1975. It was a single head device and is found in a variety of positions. The device shows signs of deterioration from about the mid 1930’s that does not seem to have been addressed. Strikes of the pattern become progressively weaker and by the 1960’s the pattern often contains many blind pins. User: The Southern Union General Insurance Coy of Australia Ltd.
Revenue Use: KGV 1926 issue 2d, 10/-. Rarity Scale: KGV 1926 issue 2d R4, 10/- R4. Background: Very little is known about the history of the Southern Union Insurance Company. This is surprising as evidence from policy documents indicates that they were trading from as early as 1926 until at least the early 1930's. What is more the company appears on the “Roll of Underwriters” in the 1934 Victorian Government Gazette. Their policy documents list offices in all Australian capital cities as well as Geelong and Launceston and Auckland, Christchurch, Dunedin and Wellington in New Zealand. Given this wide distribution of offices, even if they are only brokers acting for the Company, it is surprising that more is not known about them. 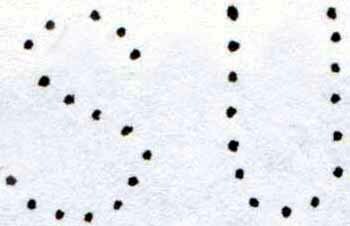 Device: This pattern is very rare and therefore there are few examples to study. The device was most likely a single head device and the shape of the letters in the pattern is rather crude. This suggests that it may have been of local manufacture in Brisbane as it is not found on stamps of other States or New Zealand. Strikes of the pattern are generally poor and the holes are not clear. The lone example on a document indicates that it was used as a cancelling device in that instance, but it may have been used as a pre cancelling device as well. 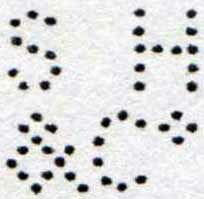 The pattern is only found on revenue stamps and the example on document indicates use in 1926. Given the poor performance of the device and its rarity it is likely that its use was short lived. This short lived usage of the device is supported by the fact that from 1930 Southern Union began embossing stamps on its policies so as to give an even greater level of security. Note: The scarcity of this perfin came about after Southern Union c1930 turned to embossing stamps on it's policies which provided a greater security.